This beautiful complex is located on 13 acres that was originally the Ocean Forest Hotel, a South Carolina landmark, in the Pine Lakes area. It is located at 5601 N. Ocean Blvd. and considered by locals as one of the most beautiful beaches on the Grand Strand. There are 1,000 feet of white sand beach for family fun or a relaxing walk. The complex has 2 pools and 2 Jacuzzis. The master suite has a queen bed, a private bath and opens to the private deck. The second bedroom has 2 twin beds. Both bedrooms have large closets. WE ARE NOW TAKING RESERVATIONS FOR 2019 and 2020. BOOK EARLY. GET THE WEEK YOU REALLY WANT. MONTHLY RATES AVAILABLE FOR OCTOBER THRU MARCH. Owned by the Hogan Family. Parents, Jane and Dan manage the rentals. We keep our place clean and well equiped for vacationers! 3 key reasons. Location, location and location. (In that order) Close enough to everything, yet quiet and private. Excellent for familys! The beach at Ocean Forest is beautiful and never crowded!! You can see your car from our balcony. No auto shut off! Please remember to un plug it after use. There are always some books in the living room. Ok to leave one or take one with you! Beautiful ocean view! ..And 2 high, comfortable, deck chairs provided! The view from the 3rd floor is spectacular! Pine Lakes C.C. (The "Grand Daddy of them all") is less than 1 mile from us. There are plenty to choose from!! This unit has two big, flat screen TVs. 82 steps to the sand!! Beach chairs, cooler and kids toys provided for you. We loved being on this end of Myrtle beach where it was quieter. The condo was as described and just what my family needed! Close to shopping, golf and right across from the beach. I loved being able to view the ocean from the balcony! So relaxing. We had a reservation at another location but the owner had to cancel just a week before we were supposed to arrive due to circumstances beyond his control. We were really stressed and relieved we were able to find this place. Thankfully, they were only there the last few days of our trip. Obviously not anything our host could control. Some people are just inconsiderate. Overall though, we had a wonderful vacation. Thank you so much for sharing your place with us! We had an amazing time! The condo was perfect for us. The view was amazing. Dan and Jane were great people to book with. Would definitely go back! Very comfortable stay. It was a nice place on the beach. It was also bike week and it was still very comfortable. The security was a nice touch as well. Only down side was there were no elevators. Not really a problem for me but maybe for an older couple. Condo was clean. We enjoyed our stay. Loved the balcony overlooking the ocean. Minimal traffic near the condo and very quiet neighborhood. We were there for a homeschool conference and this was close to where we needed to be for that. My family and I had no problems. Bed in master slept pretty well, mattress may need to be flipped, but otherwise it was fine. Another review mentions a plastic cover it is nothing more than a mattress protector and with a fitted sheet over it we had no problem sleeping on it. I slept better at the condo then I do at home. We did not use the appliances other than fridge while there, but I can say there was a pot or dish for anything you may need. I enjoyed the living room and having a private balcony where the door could be opened in the evening air conditioner turned off and just the ocean breeze and waves crashing could be heard. Convenient location with everything you need! 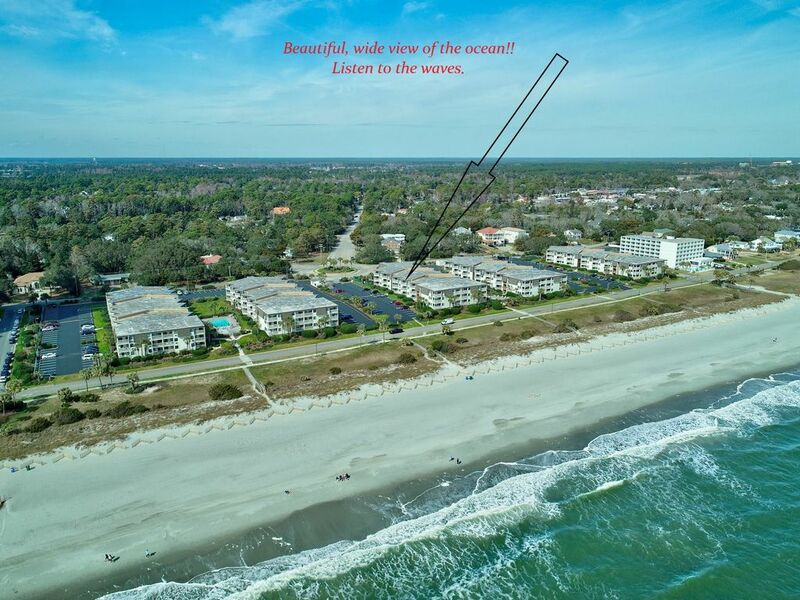 This property is located right on the beach and is everything you need for any length of stay in Myrtle Beach. It's a convenient location to get to anywhere you'd like to go, but also feels like a quiet neighborhood. I'd book this condo again in a heartbeat. ...another "happy guest"!! You are always welcome Haley. Thank you for the kind words. NEW 40" HD TV in living room! New stove and new dishwasher and NEW 32" WALL HUNG, HD TV in master bedroom! We are within minutes of ALL that Myrtle Beach has to offer, Over 100 golf courses are within minutes, as are Barefoot Landing, Broadway At The Beach, Restaurant Row, The Carolina Opry and The Alabama Theater. ***Free bus shuttle to Broadway at the Beach! !